The vinyl flooring options we offer are vastly different from the vinyl of the past. In our flooring showroom today, you can find stylish and durable luxury vinyl tile in eye-catching patterns, gorgeous designs, and appealing colors. Made with advanced technology, luxury vinyl floor tile features the appearance of high-end flooring materials, such as natural stone and hardwood. Let us help you upgrade your home décor with modern, affordable resilient flooring. Our staff of professional design consultants is happy to help you locate the right luxury vinyl tile in Painesville, OH. We will even send you home with samples. Plus, we provide guaranteed professional LVT installation. From start to finish, we help you realize your interior design and remodeling goals. Luxury vinyl plank flooring mimics all types of wood and even has a texture that looks like wood-grain. These floors resemble many different wood species and come in a variety of widths. Our showroom offers numerous styles of this cost-effective alternative to the pricier hardwood. Vinyl planks possess that gorgeous graininess and luster that you associate with hardwood. This flooring even comes in planks, just like wood. However, it is very affordable and even more so with the buying power we exercise from our association with so many nationwide Flooring America stores. Looking to steer your interior design efforts in a new direction? Try out luxury vinyl floor tile. 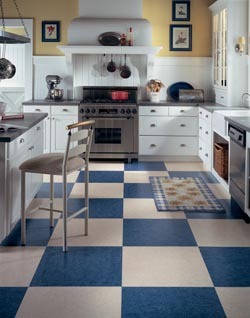 Vinyl floor tile is available in many different sizes and shapes, which allows for a wealth of customization options. Mix and match to create a design that is unique to your interior. Thanks to contemporary manufacturing methods, LVT can successfully emulate the look and texture of many other flooring materials, such as ceramic and slate. As a result, you can impart an elegant atmosphere to your home. In addition, vinyl is able to retain heat better, which makes for a pleasant feeling underfoot. By adding style and comfort to your flooring, your house is much more like a home. There’s a reason why LVT and planks are known as resilient flooring. Through everyday wear and tear, luxury vinyl remains strong and beautiful. Unlike wood, vinyl is easy to maintain and clean. This flooring does not require buffing and sanding and special products and equipment to maintain. We recommend that you wipe up spills as they occur, and dry mop and damp mop as needed to keep these floors gleaming with the beauty of wood. Vinyl flooring is specially engineered to keep looking new far into the future. It is made with layers that protect the flooring. The top layer, which is known as the wear layer, is the thickest layer. This protective layer guards the layers underneath from damage. Below the top layer is a design layer, which contains the image for the design – a species of wood, natural stone, or ceramic tile. Protecting the design from damage means your luxury vinyl tile or plank always looks like real tile or wood. Other layers help the floor adhere to the subfloor for smooth installation. With luxury vinyl tile and vinyl planks, you get all the benefits of vinyl flooring. This durable flooring is made for wear and tear and is water-resistant. This means you can place it in areas where water is in use, such as the kitchen and bathroom, or in rooms where there is high moisture content, such as the basement. Wherever you may place this flooring, you can have confidence knowing it will look and perform great for years to come. Affordability: Luxury vinyl tile and plank have the aesthetics of traditional flooring materials, but at a much lower cost. This allows you to cover more of your rooms while staying within your remodeling budget. Our 12 month fianacing can help you keep your costs low and your new floors easy to purchase. Durability: This flooring option is engineered to last. By creating flooring that resists water and everyday wear, luxury vinyl has become a dependable option for active households. It’s a great choice for homes with pets and children. Versatility: Vinyl is a welcome addition to virtually any room in the home. It’s a great investment for the kitchen, bathroom, and anywhere in between. Easy to Install: Our technicians work hard to ensure you get the most out of your investment. Many installation projects involving vinyl can be completed quickly, so you can enjoy your new flooring sooner. Numerous Style Varieties: Available in many different colors and designs, luxury vinyl can be mixed and matched to cater to your design sensibilities. LVT is also available in configurations that resemble other flooring materials. Water-Resistant: The non-porous composition of vinyl makes this flooring highly resistant against spills and stains. Mold and mildew are less likely to develop on this material, making it a hygienic choice for the safety-minded homeowner. Flooring is always an investment. It improves the atmosphere and overall appearance of your interior. In turn, it also contributes greatly to the attractiveness and value of your home. Get the most out of your investment with our help. Our local flooring store has qualified installers on staff who perform accurate luxury vinyl tile installation at reasonable rates. Trust us to install the flooring of your choice with skill and speed. Our installers have the training and experience to handle any room, no matter the shape or size. You can expect them to offer you the same great level of service you associate with our store. They will arrive on schedule and stay until the job is properly completed. Contact us today to find out more about luxury vinyl tile and 12 month financing plans. We're proud to serve customers in Painesville, Lake County, Mentor, Concord, and Willoughby, Ohio, as well as the surrounding area.